The 760,000-square-foot (71,000 m2) facility was made possible by a $65 million gift in October 1999 to the Smithsonian Institution by Steven F. Udvar-Házy, an immigrant from Hungary and co-founder of the International Lease Finance Corporation, an aircraft leasing corporation. The main NASM building, located on the National Mall in Washington, D.C, had always contained more artifacts than could be displayed, and most of the collection had been stored, unavailable to visitors, at the Paul E. Garber Preservation, Restoration, and Storage Facility in Silver Hill, Maryland. A substantial addition to the center encompassing restoration, conservation and collection-storage facilities was completed in 2010. Restoration facilities and museum archives were moved from the museum's Garber facility to the new sections of the Udvar-Hazy Center. Panorama of the interior of the Udvar-Hazy Center. The Mary Baker Engen Restoration Hangar in January 2013. The Space Shuttle Discovery is in the background. Designed by Hellmuth, Obata and Kassabaum, who also designed the National Air and Space Museum building, the Center required 15 years of preparation and was built by Hensel Phelps Construction Co. The exhibition areas comprise two large hangars, the 293,707-square-foot (27,286.3 m2) Boeing Aviation Hangar and the 53,067-square-foot (4,930.1 m2) James S. McDonnell Space Hangar. 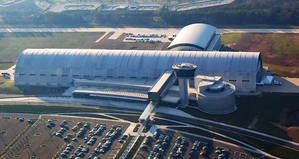 The Donald D. Engen Observation Tower provides a view of landing operations at adjacent Washington Dulles International Airport. The museum also contains an IMAX theater. A taxiway connects the museum to the airport. Phase Two of the Udvar-Hazy Center will be dedicated to the behind-the-scenes care of the Smithsonian's collection of aircraft, spacecraft, related artifacts and archival materials. On December 2, 2008, the Steven F. Udvar-Hazy Center received a gift of $6 million for phase two from Airbus Americas Inc. — the largest corporate gift to the Smithsonian Institution in 2008. The Mary Baker Engen Restoration Hangar — spacious enough to accommodate several aircraft at one time with a second-floor viewing area designed to give visitors a behind-the-scenes look. Archives — the foremost collection of documentary records of the history, science and technology of aeronautics and space flight will be housed in a single location for the first time, providing researchers with ample space and equipment. The Emil Buehler Conservation Laboratory — will provide conservators much-needed space to develop and execute specialized preservation strategies for artifacts. Collections processing unit — a dedicated loading dock and specially designed secure area for initial inspection and analysis of artifacts. The orbital spacecraft Space Shuttle Discovery was put on public display in the James S. McDonnell Space Hangar on April 19, 2012, replacing the atmospheric test vehicle, Enterprise. During the night of April 19, Enterprise was loaded onto a Shuttle Carrier Aircraft in preparation for its trip to John F. Kennedy International Airport in New York City on April 27, 2012, for final destination at the Intrepid Sea, Air & Space Museum. Enterprise had been on display in the Space Hangar since the museum opened in 2003. Grumman F-14 Tomcat fighter involved in the Gulf of Sidra incident (1989). A piece of fabric from the LZ 129 Hindenburg that survived the Hindenburg disaster. The Shuttle Radar Topography Mission payload that flew on STS-99. The museum is still in the process of installing exhibits, and 169 aircraft and 152 large space artifacts were on display as of May 2012, and plans call for the eventual installation of over 200 aircraft. The current list is maintained at the Objects On Display page of the Smithsonian Institution NASM Collections site. A number of events are held at the museum throughout the year. These include lectures, book signings, sleepovers, and events for children. Some of the museum's larger events include Air & Scare for Halloween, an open house, and Innovations in Flight: Family Day and Outdoor Aviation Display. The center made its first media appearance in the 2009 film Transformers: Revenge of the Fallen. The center remained open while filming took place, although certain areas were closed. The SR-71 that is on display in the museum was used as Jetfire, a Decepticon who switches sides to become an Autobot, in the film. In the film, it is referred to simply as the National Air and Space Museum. ^ "Visitor Statistics". Smithsonian Newsdesk. Retrieved March 23, 2018. ^ Small, L. M. "A century's roar and buzz: Thanks to an immigrant's generosity, the Steven F. Udvar-Hazy Center opens to the public". In "From the Secretary". Smithsonian. Vol. 34, p. 20. ^ Triplett, W. "Hold everything!" Smithsonian. Vol. 34, December 2003, p. 59. ^ a b c "National Air and Space Museum Press Kit: Steven F. Udvar-Hazy Center Fact Sheet". Smithsonian Institution. Archived from the original on April 7, 2009. Retrieved May 25, 2012. ^ "Space Shuttle Discovery Flies to the Smithsonian". Smithsonian National Air and Space Museum. April 17, 2012. Archived from the original on May 7, 2012. Retrieved May 25, 2012. ^ "Events | National Air and Space Museum". airandspace.si.edu. Retrieved February 6, 2016. ^ "Air & Scare | National Air and Space Museum". airandspace.si.edu. Archived from the original on February 6, 2016. Retrieved February 6, 2016. ^ "Steven F. Udvar-Hazy Center Open House | National Air and Space Museum". airandspace.si.edu. Archived from the original on February 6, 2016. Retrieved February 6, 2016. ^ "Family Day and Outdoor Aviation Display - Innovations in Flight Aircraft Display". Innovations in Flight Aircraft Display. Retrieved February 6, 2016. ^ Keith Knight (June 7, 2008). "More High-Fliers at Air & Space". The Washington Post.